A micro burst - a strong sudden downward thrust of wind - probably caused the crash of the Armed Forces of Malta plane at Dwejra on Sunday evening, according to sources familiar with aviation. The two aircrew only managed to survive because the aircraft did a cartwheel after its right wing hit the ground, which slowed its momentum instead of smashing into the surface of the land or sea. Aviation industry sources called the incident nothing short of a miracle. The AFM Bulldog, a small plane used for coastal patrol, surveillance and training, crashed near Dwejra in Gozo at about 7.30 p.m. Warrant Officer Mark Brincat who was piloting the aircraft, and Lance Bombardier Kevin Borg, the flight technician, suffered only minor injuries, apart from seat belt bruises. Mr Brincat needed two stitches on his nose while Mr Borg suffered a black eye and a small cut next to one of his eyes. Eyewitnesses told The Times that the aircraft was seen climbing above the Azure Window at Dwejra when it suddenly seemed to stall. It fell to earth and ended up on a bird-trapping site at Santu Pietru, a tract of land between Dwejra and San Dimitri. Aviation industry sources said the accident was probably weather related. "A micro burst, commonly known as an air pocket, is at its worst when it hits a small aircraft from above. The aircraft will keep flying, trapped in a cube of air, but it will be caught in a downward horizontal movement and you do not have enough power to get out of it. The rate of descent induced by the micro burst will exceed the plane's maximum climb rate, leading to an unavoidable crash. It happens in an instant." Sources said the pilot attempted to avoid the accident by trying to fly at full speed but the aircraft had already lost height. Its right wing clipped the ground and the plane was sent tumbling, hitting its nose, then its left wing. It then flipped over, hitting its tail before coming to rest upside down. On impact, the cockpit slid open. The engine ended up by the side of the plane. The plane stopped close to the area of its first impact and did not leave a trail of debris, just part of its right wing and its left wheel. The front wheel has not yet been located. Sources said the cockpit was the only thing that remained intact. The aircrew's jackets, however, got soaked in aviation fuel with the manifold of an exhaust pipe inches away from theirfaces. "It was indeed nothing short of a miracle that they walked away from the incident. Some young people in the area rushed to help them out. They were then taken by helicopter to hospital. Without doubt, the way the plane cartwheeled is what led to the survival of the crew. "The aircraft normally flies for about an hour. It had been airborne for about 25 minutes and still had enough fuel for a flight of over two-and-a-half hours. Had the plane burst into flames, the chances of survival would have been slim and had the plane nose-dived, the chances of survival would have been even slimmer. Had the plane not hit its wing, it would have probably ended up in the sea," the sources said. The Bulldog was one of five the AFM bought from the Royal Air Force in 2000. One was grounded following a collision with an Enemalta van on the runway in July, 2005 as it was taxiing for take-off. None of the aircrew was injured but the aircraft has still not been repaired as discussions with the insurance company are still underway. 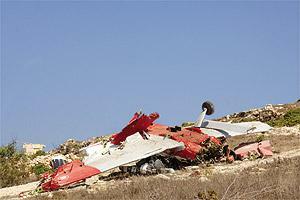 Brigadier Carmel Vassallo said the aircraft's maintenance record will be inspected as part of the internal inquiry. There are two other inquiries underway: One by the Department of Civil Aviation and another by the duty magistrate. Mr Brincat was one of the first AFM pilots to fly the Bulldog and, after 15 years, has accumulated a considerable number of flying hours.